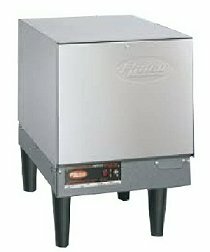 The Hatco Compact Electric Booster Water Heater provides all the 180°F (82°C) final rinse water required to sanitize and flash-dry dishes and flatware. The space saving Compact is easy to install next to the dishwasher with slide brackets or on 6" (152 mm) legs. The storage capacity is 6 gallons (23 liters). • All models include a Castone® lined tank with a 10-year limited warranty. • Features include a temperature/pressure relief valve, a pressure reducing valve, two temperature/pressure gauges, a high-temperature limit control, pilot indicator light, on-off switch, and a low-water cut-off to prevent element burnout due to a low water condition. • Available with slide brackets for mounting under a dishtable. • Each booster has fiberglass insulation to minimize heat loss. • Hatco electric booster heaters are factory pre-plumbed and pre-wired with calibrated immersion thermostat and high-temperature limit switch. • A stainless steel front panel and powder-coated silver-gray hammertone body is standard on all Compact models. • Swing-away front panels with low-water cut-off, control fuses and transformer allow quick access to probes and elements for easier serviceability.